Katie Galloway graduated with a B.M. in Music Education from the University of North Carolina at Wilmington in December 2010. During her time at UNCW, she actively performed throughout the community by participating in Wilmington Symphonic Winds and the Wilmington Symphony Orchestra, as well as playing various gigs around town. 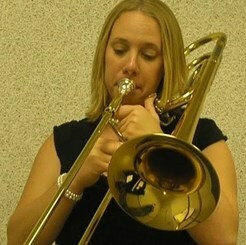 She has been playing piano and trombone for twenty years, and studied both instruments privately in college. She is currently teaching for New Hanover County Schools, and has been teaching private lessons for ten years. Katie enjoys teaching music, and hopes to inspire others to appreciate and love music. When teaching, she uses a variety of teaching methods to best suit the needs of each student, helping the student to be successful and motivated in their private study.